For the battle in 1874, see Second Battle of Adobe Walls. The First Battle of Adobe Walls, was a battle between the United States Army and American Indians. The Kiowa, Comanche and Plains Apache (Kiowa Apache) tribes drove from the battlefield a United States Expeditionary Force that was reacting to attacks on white settlers moving into the Southwest. The battle, November 25, 1864, resulted in light casualties on both sides but was one of the largest engagements fought on the Great Plains. The battle of Adobe Walls occurred on November 25, 1864, in the vicinity of Adobe Walls, the ruins of William Bent's abandoned adobe trading post and saloon, located on the northern side of the Canadian River 17 miles (27 km) northeast of present day Stinnett in Hutchinson County. The battle came about when General James H. Carleton, commander of the military district of New Mexico, decided to punish severely the plains tribes of the Kiowa and Comanche, whom he deemed responsible for attacks on wagon trains on the Santa Fe Trail. The Indians saw the wagon trains as trespassers who killed buffalo and other game the Indians needed to survive. As the American Civil War drained available troops, attacks on the Great Plains worsened, leading in the later part of 1863 to cries from settlers for protection. General Carleton wanted to put an end to the raids, or at least to send a sharp signal to the Indians that the Civil War had not left the United States unable to protect its people. He selected Col. Christopher (Kit) Carson to lead the expeditionary force as the most seasoned veteran Indian fighter at his disposal. Col. Carson took command of the First Cavalry, New Mexico Volunteers, with orders to proceed against the winter campgrounds of the Comanches and Kiowas, which were reported to be somewhere in the Palo Duro Canyons of the southern Panhandle area, on the south side of the Canadian River. The Carson expedition was the second invasion of the heart of the Comancheria, after the Antelope Hills Expedition. 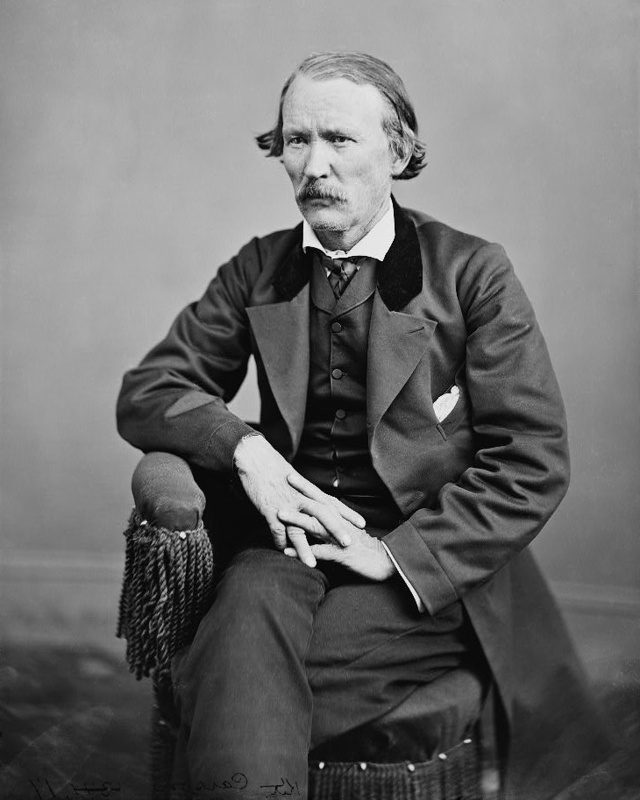 A photograph taken of Kit Carson shortly before his death in 1868. On November 10, 1864 Carson started from Fort Bascom with 260 cavalry, 75 infantry, and 72 Ute and Jicarilla Apache scouts that he had recruited from Lucien Maxwell's ranch near Cimarron, New Mexico. On November 12, Carson’s force, accompanied by two mountain howitzers under the command of Lt. George H. Pettis, twenty-seven wagons, an ambulance, and with forty-five days' rations, proceeded down the Canadian River into the Texas Panhandle. Carson had decided to march first to Adobe Walls, which he was familiar with from his employment there by Bent more than 20 years earlier. Carson, long familiar with the Utes and Jicarillas, had confidence in his Indian scouts. They covered his flanks and each morning two of them rode far ahead of the slow-moving column to search for Comanche and Kiowa encampments. Inclement weather, including an early snow storm, caused slow progress. On November 24, 1864, the First Cavalry reached Mule Springs, in Moore County, approximately 30 miles (48 km) west of Adobe Walls. That same afternoon, the Indian scouts reported they had found the trail of a large Indian village. Carson left his infantry behind to guard his supply train and ordered a night march of cavalry and artillery. He rode in the van with the Utes and Jicarillas. Next morning he ordered the two howitzers forward to join him in the van. Coming to the easily-fordable Canadian River he deployed one company of cavalry on the north side of the river and continued with the remainder on the south side. Approximately two hours after daybreak on November 25, 1864, Carson's cavalry found and attacked a Kiowa village of 176 lodges. The Chief, Dohäsan, and his people fled, passing the alarm to allied Comanche villages nearby. Marching forward to Adobe Walls, four miles from the Kiowa village, Carson dug in there about 10:00 am, using one corner of the ruins for a hospital. Carson discovered to his dismay that there were numerous villages in the area, including a large Comanche village. Carson saw large numbers of Indians pouring forward to engage him in battle, a much greater force than he had expected. Captain Pettis, who wrote the most complete report of the battle, estimated that 1,200 to 1,400 Comanche and Kiowa attacked the soldiers and Indian scouts who numbered 330, 75 men having been left behind to guard the supply train. "Throw a few shells into that crowd over there". Carson dismounted his cavalry and deployed them around the two howitzers. His Indian scouts skirmished with about 200 Comanche and Kiowa warriors "mounted and covered with paint and feathers...charging backwards and forwards...their bodies thrown over the sides of their horses, at a full run, and shooting occasionally under their horses." Dohäsan, assisted by Satank and Satanta, led the Kiowas in the first attack. Fierce fighting developed as the Kiowa, Plains Apache, and Comanche warriors repeatedly attacked Carson's position. Satanta replied to Carson's bugler with his own bugle calls to confuse the soldiers. Carson succeeded in repelling the attacks only through his clever use of supporting fire from the twin howitzers. The first shells from the howitzers caused the Comanche and Kiowa to retire from the battlefield, but they soon returned in even greater numbers and renewed the attack. By afternoon, Pettis estimated Carson's army faced more than 3,000 Indians. After six to eight hours of fairly continuous fighting, Carson realized he was running low on howitzer shells, and ammunition in general, and ordered his forces to retreat to the Kiowa village in his rear. Carson was also concerned about the fate of the 75 men guarding his much-needed supply train. The Indians tried to block his retreat by setting fire to the grass and brush down near the river. The wily Carson, however, set back-fires and retreated to higher ground, where the twin howitzers continued to hold off the Indians. When twilight came, Carson ordered about half his command and his Indian scouts to burn the lodges of the village, which also resulted in the death of the Kiowa-Apache chief, Iron Shirt, who refused to leave his tipi. The soldiers confiscated many "finely finished buffalo robes" and burned the rest and the Indian scouts killed and mutilated four Kiowas too decrepit to flee. The weary soldiers continued their retreat and found their supply train intact that night. Carson and his soldiers rested in camp on November 26, their Indian opponents visible on a hilltop about two miles away. Carson's Indian scouts skirmished with the Comanche and Kiowa but no serious attack was mounted on the soldiers. The next day, Carson gave the order to return to New Mexico. Some of his officers wished to renew the battle, but Carson, consulting only with his Utes and Jicarillas, ordered the retreat to New Mexico. The United States Army declared the First Battle of Adobe Walls a victory. The Kiowa, to the contrary, recorded in their annual record, painted on buffalo skin, that the period was "muddy travel winter, the time when the Kiowas repelled Kit Carson." Carson was well known by all the Indians of the Southern Plains. The battle left the Comanche and Kiowa unchallenged in their control of the Texas Panhandle until the Battle of the North Fork of the Red River eight years later. Most authorities believe that Carson's decision to retreat was wise and that he deserves credit for a good defense. He was outnumbered and only his clever use of back-fires and the howitzers prevented his force being overrun and massacred as Custer was later at the Little Bighorn. The number of Indians engaged against Carson in this battle has often been estimated as high as 3,000, but that is likely an exaggeration. The total number of warriors possessed by the Comanche, Kiowa, and Kiowa-Apache probably did not total anywhere near 3,000. As the Kiowa village consisted of 176 lodges and the Comanche village of about 500 lodges, it is unlikely that the total Indian force numbered more that two fighting men per lodge or 1,300. As it was, Carson lost six dead and twenty-five wounded, including one Indian scout killed and four wounded, while he estimated that the Comanche and Kiowa lost approximately fifty to sixty killed and as many as 100 wounded. The official U.S. army report on the battle estimated an Indian loss of 60 killed and wounded. Given the long distance nature of the fighting the estimate of Indian casualties can only be a guess. Only one Comanche scalp was reported taken by Carson's soldiers. The First Battle at Adobe Walls would be the last time the Comanche and Kiowa forced American troops to retreat from a battlefield, and marked the beginning of the end of the plains tribes and their way of life. A decade later, the Second Battle of Adobe Walls was fought on June 27, 1874 between 250 to 700 Comanche and a group of 28 hunters defending the settlement of Adobe Walls. After a four-day siege, the Indians withdrew. The Second Battle is historically significant because it led to the Red River War of 1874-75, resulting in the final relocation of the Southern Plains Indians to reservations in what is now Oklahoma. Historical Marker for First Battle of Adobe Walls. 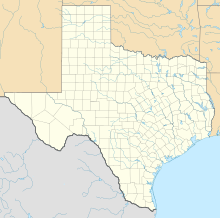 In 1964, the Texas State Historical Survey Committee erected Historical Marker 1690 to preserve the memory of the First Battle of Adobe Walls. The marker is not located at the actual battle site, but is located 15 miles to the west. The marker states that "though Carson made a brilliant defense, the Indians won." ↑ 3.0 3.1 3.2 3.3 3.4 3.5 Trosser, John (2004). Adobe Walls Texas, September 7, 2007. ↑ 5.0 5.1 Comanches, The Destruction of a People. Oxford Press, 1949. ↑ The Comanches: Lords of the Southern Plains. University of Oklahoma Press. 1952. ↑ Kavanagh, Thomas W. The Comanches Lincoln: U of NE Press, 1999, pp. 472-473. In 1869, five years later, the total population of the three tribes was estimated to be 6,565 of which not more that one-fourth, or about 1,600, would be adult males. ↑ The Comanche Barrier to South Plains Settlement: A Century and a Half of Savage Resistance to the Advancing White Frontier. Arthur H. Clarke Co. 1933. Bial, Raymond. Lifeways: The Comanche. New York: Benchmark Books, 2000. Frazier, Ian. Great Plains. New York: Farrar, Straus, and Giroux, 1989. John, Elizabeth and A.H. Storms Brewed in Other Men's Worlds: The Confrontation of the Indian, Spanish, and French in the Southwest, 1540–1795. College Station, TX: Texas A&M Press, 1975. Jones, David E. Sanapia: Comanche Medicine Woman. New York: Holt, Rinehart and Winston, 1974. Lodge, Sally. Native American People: The Comanche. Vero Beach, Florida 32964: Rourke Publications, Inc., 1992. Lund, Bill. Native Peoples: The Comanche Indians. Mankato, Minnesota: Bridgestone Books, 1997. Mooney, Martin. The Junior Library of American Indians: The Comanche Indians. New York: Chelsea House Publishers, 1993. Native Americans: Comanche (August 13, 2005). Richardson, Rupert N. The Comanche Barrier to South Plains Settlement: A Century and a Half of Savage Resistance to the Advancing White Frontier. Glendale, CA: Arthur H. Clark Company, 1933. Rollings, Willard. Indians of North America: The Comanche. New York: Chelsea House Publishers, 1989. Secoy, Frank. Changing Military Patterns on the Great Plains. Monograph of the American Ethnological Society, No. 21. Locust Valley, NY: J. J. Augustin, 1953. Streissguth, Thomas. Indigenous Peoples of North America: The Comanche. San Diego: Lucent Books Incorporation, 2000. "The Texas Comanches" on Texas Indians (August 14, 2005). Wallace, Ernest, and E. Adamson Hoebel. The Comanches: Lords of the Southern Plains. Norman: University of Oklahoma Press, 1952.